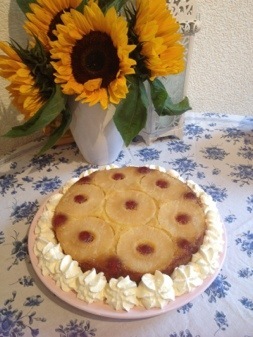 I made this pineapple upside down cake for a Clandestine Cake Club event that just happened to be the same week as the first episode of Great British Bake Off. Now, here’s a confession, I hadn’t actually watched Bake Off before. However, so many people assumed I’d seen it and been inspired that I started watching and then, like the rest of the nation, became hooked! One thing I will not negotiate is that it must be served with cream of some kind. As a dessert it it sublime just slightly warm with vanilla ice cream. You can pipe the cream around it, as I did here, or just have a big bowl of whipped cream for dolloping! I’ve even served it with the suspiciously named ‘Topping’ when cream was unobtainable in Japan. It simply isn’t the same without some kind of cream, I’m afraid! – Heat the oven to gas mark 4/ 180C and well grease and line a 23cm springform cake tin. – Drain the pineapple slices and place on kitchen towel while you make the cake mix. – Cream the butter and the sugar together until light and fluffy. – Gradually add the eggs and the vanilla, mixing well between additions. – Finally, add the flour and baking powder and mix thoroughly until totally combined. – Add the milk and mix well. 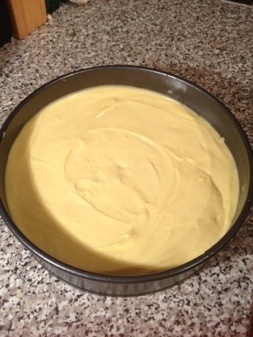 – Make sure there is a good layer of butter on the base of your lined cake tin. 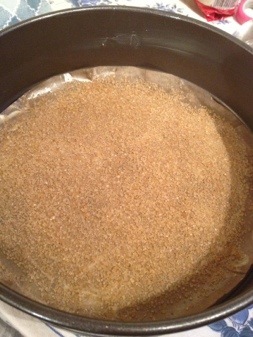 Then sprinkle over the demerara sugar evenly. 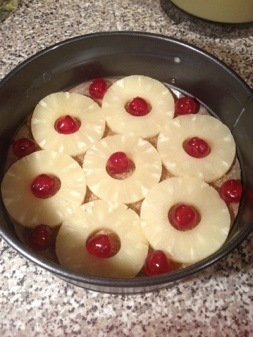 – Arrange the pineapple slices and glacé cherries in the base of the tin. – Pour over the cake batter and smooth to make a level cake. – Bake for about 40 minutes in the centre of the oven until the wobble disappears and a skewer inserted into the cake comes out clean. – Turn out onto a plate immediately and then leave to cool either completely or until just warm and serve with either whipped cream or ice cream. This is so not a recipe nor does it actively feature any food at all but it is totally worthy of a blog post. 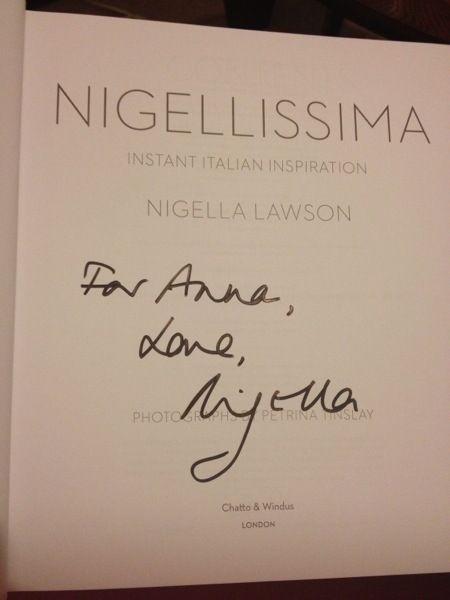 Because I went to a book signing event on Tuesday and met Nigella!!!!!!!!! Colour me one happy little foodie! 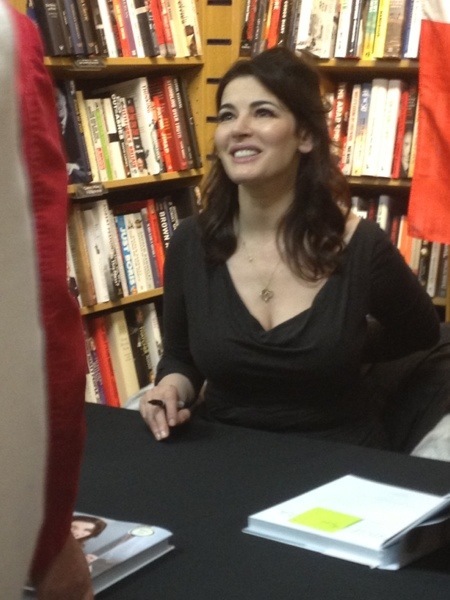 Obviously, we didn’t exactly interact overly much but she seems lovely and just as gorgeous in real life. The woman glows!